When I was a kid, places like this held amazing powers of attraction for me. They still do. The camera doesn’t do it justice, though. This arroyo is almost 20 feet deep, and I had to be careful about not falling in when I took the shot. Consider that the sagebrush is about two to three feet high, and you’ll get a better sense of scale. The bottom isn’t really visible in this photo. If I were walking through, you wouldn’t see my head. I could have been a geologist. Just look at the layers exposed by erosion: where did all those rocks come from? A violent volcanic blast? Debris from roaring ancient rivers? Some of the stones are “river rocks,” rounded as if from tumbling in the current. Many are quite huge. Seeing the bank exposed like this always gets me excited. What else is down there? Fossils, artifacts? 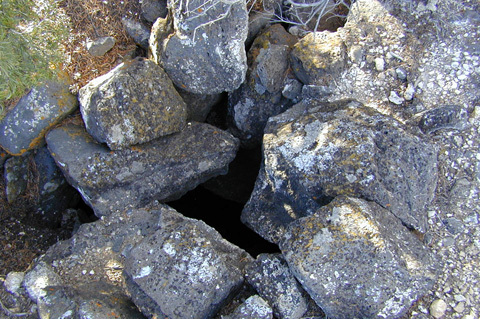 Animal burrows?—yes to that. I have one spotted with what looks like a couple of bones in front. So at some point I’ll be walking down there and we’ll see. It scares me a little to think of that, as there isn’t an escape route. This spot is close to where I fell down twice mysteriously. A little farther up the hill from here, I left an offering of Navajo smoking mix (tobacco, herbs, etc.) and asked to be clued in. Nothing happened, but I am told the protocol involves more subtlety. As in not asking, for example. Not even trying to listen. There are so many places full of mystery and power in this part of the world. I know a place in Colorado, high atop a cliff, where I can drop a rock into a hole and never hear it hit the bottom. * What do you suppose is down there? What kinds of skeletons, shaman relics, jewels from other worlds? We just can’t know. But sure as hell there’s something. * It’s been years, I’d want to check again. In any case, it sure is scary! The only advice I can offer you is, “Don’t fall down.” I am, however, in total joy at the photos you take. 🙂 Thank you so much for the pieces of your life you give us.